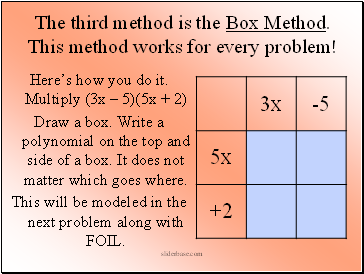 multiply two polynomials using the FOIL method, Box method and the distributive property. 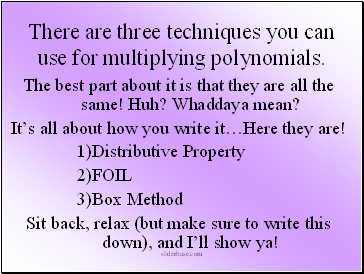 There are three techniques you can use for multiplying polynomials. The best part about it is that they are all the same! Huh? Whaddaya mean? It’s all about how you write it…Here they are! Sit back, relax (but make sure to write this down), and I’ll show ya! Using the distributive property, multiply 2x(5x + 8) + 3(5x + 8). 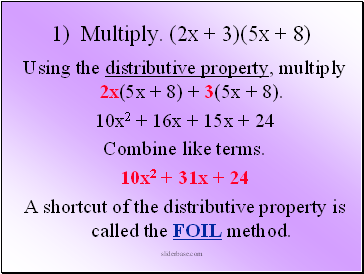 A shortcut of the distributive property is called the FOIL method. The FOIL method is ONLY used when you multiply 2 binomials. 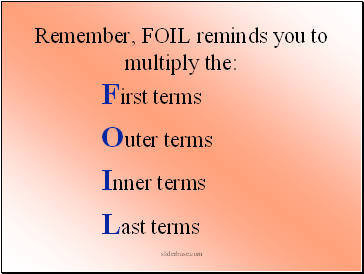 It is an acronym and tells you which terms to multiply. 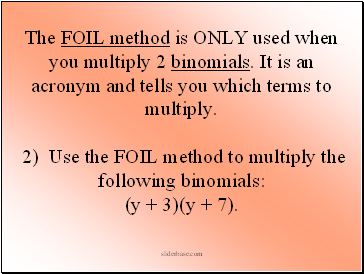 2) Use the FOIL method to multiply the following binomials: (y + 3)(y + 7). (y + 3)(y + 7). 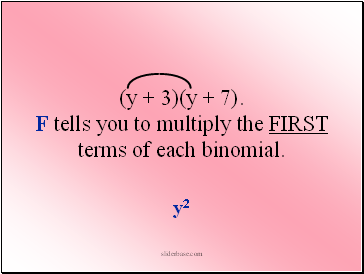 F tells you to multiply the FIRST terms of each binomial. (y + 3)(y + 7). 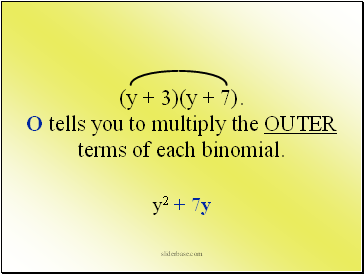 O tells you to multiply the OUTER terms of each binomial. (y + 3)(y + 7). 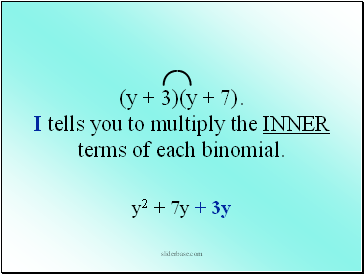 I tells you to multiply the INNER terms of each binomial. (y + 3)(y + 7). 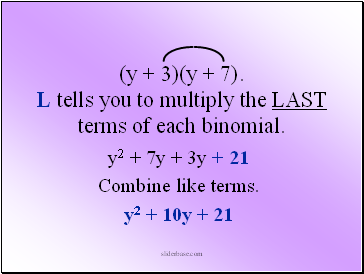 L tells you to multiply the LAST terms of each binomial. The third method is the Box Method. This method works for every problem! Draw a box. 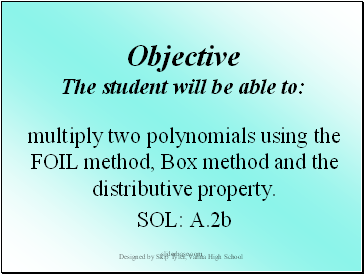 Write a polynomial on the top and side of a box. It does not matter which goes where. This will be modeled in the next problem along with FOIL.